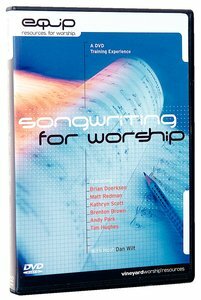 Learn the craft of worship songwriting from some of the most influential worship writers of our day, this DVD is a training experience that invites you to explore how these songwriters address such issues as song inspiration, writer's responsibility, song structure, lyric writing, melodic development, re-writing and much more. Insightful interviews offer more cutting edge training that is sure to motivate both the seasoned and emerging worship songwriter. Features: Brian Doerksen, Brenton Brown, Kathryn Scott, Matt Redman, Andy Park, Tim Hughes and host Dan Wilt.